Wear a mint biker jacket with a Valentino Garavani large candystud leather pouch, if you want to dress for comfort without looking like you don't care. To add oomph to your getup, round off with grey snake leather heeled sandals. If you're all about comfort dressing when it comes to fashion, you'll love this extra adorable pairing of a light blue fur jacket and a Valentino Garavani large candystud leather pouch. If you're all about relaxed dressing when it comes to your personal style, you'll love this totally stylish combo of a black floral sheath dress and a Valentino Garavani large candystud leather pouch from Nordstrom. Dress up your outfit with grey satin heeled sandals. If you're obsessed with relaxed dressing when it comes to fashion, you'll love this super cute pairing of a beige button down blouse and a Valentino Garavani large candystud leather pouch. 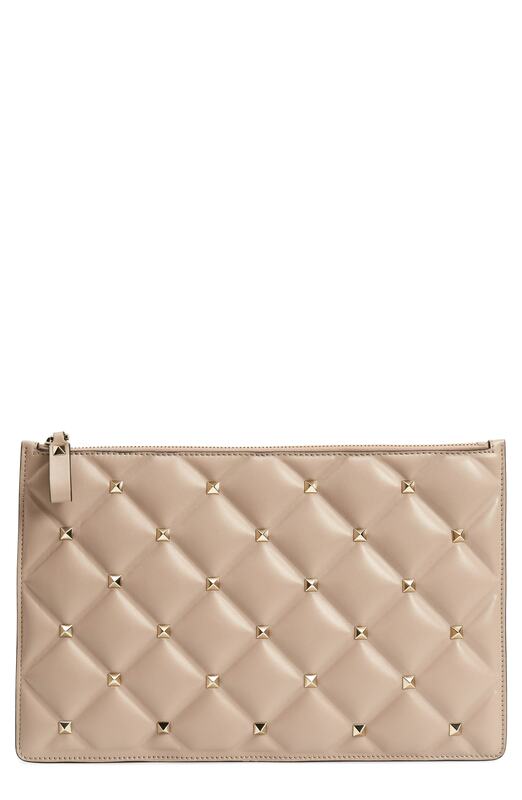 Rock a silver shift dress with a Valentino Garavani large candystud leather pouch from Nordstrom for a casual get-up. For something more on the daring side to complete this getup, opt for a pair of blue athletic shoes. If you're a fan of functionality dressing when it comes to fashion, you'll love this super cute pairing of a pink blazer and a beige quilted leather clutch. Rock a pair of silver leather pumps to va-va-voom your outfit.